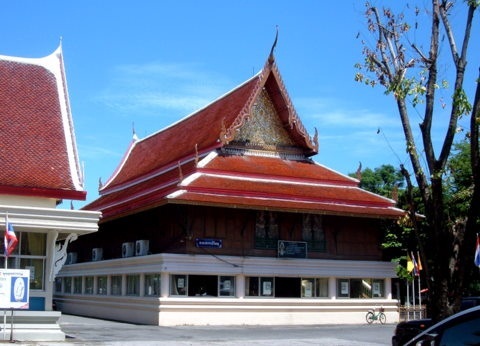 Wat Sri Sudaram is an old temple by the Bangkok Noi canal where the famous Thai poet Sunthorn Phu studied as a boy. 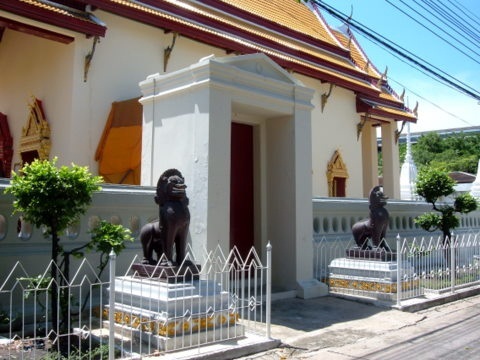 It’s one of the many temples in the guided boat tour of the Bangkok Noi canal. 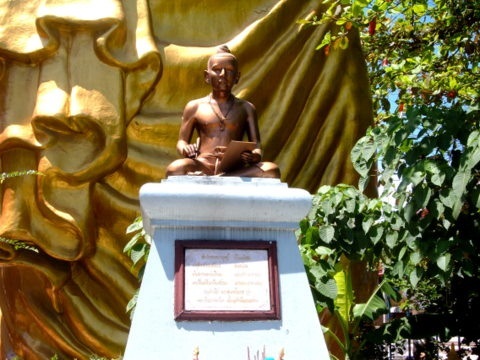 Sunthorn Phu (1786 – 1855) is one of Thailand’s most famous, if not the most famous, poet who lived through four reigns of the Chakri Kings (King Rama I – King Rama IV). In the reign of King Rama IV, Sunthorn Phu was bestowed the title Phra Sunthorn Voharn and appointed Poet Laureate. 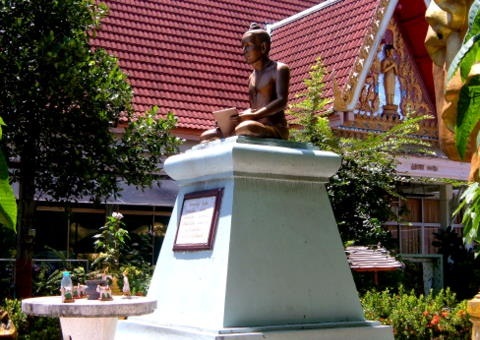 Thai children learn about Sunthorn Phu’s poems in junior school and 26 June is Sunthorn Phu Day in Thailand when dedication ceremonies are held in schools for the great poet. On the bicentennial of his birth in 1986, UNESCO accorded him the honour of World Poet. Almost all the tourists visit Wat Sri Sudaram by boat with guides on board blaring out commentaries in various languages. 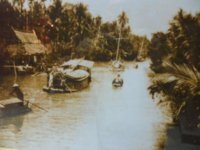 The boats stop briefly for the tourists to view the temple from their boats and feed the fish in the canal without alighting. Considering that such a personality as Sunthorn Phu studied at Wat Sri Sudaram, that’s such a shame! It’s like passing Shakespeare’s King Edward VI Grammar School in Stratford-upon-Avon without stepping out of the bus! So let’s take a self-guided tour of this temple where the famous poet was schooled. 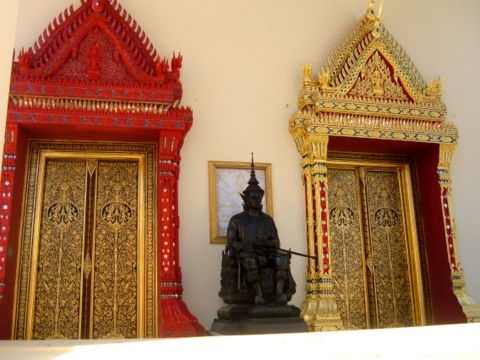 Here’s a map to Wat Sri Sudaram and directions on how to get there on your own by land. 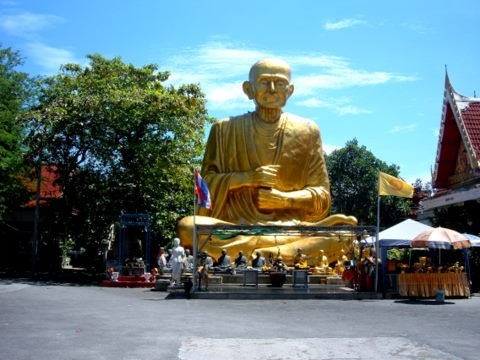 The temple was originally called Wat Chi Pa Khao. Some of the buildings were built in the Ayutthaya era. 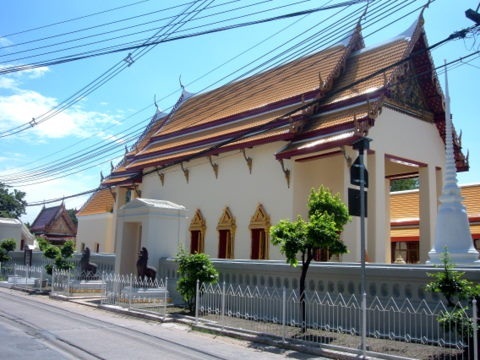 It was restored in reign of King Rama I and again in the reign of King Rama IV when the ubosot (ordination hall) was rebuilt. The temple was then renamed Wat Sri Sudaram. The name of the temple is prominent the moment you reach the soi (lane). There’s an arch at the junction with the name of the temple. The soi leading in is named after the temple. The school on the right definitely wasn’t there during Sunthorn Phu’s time. In those days all schooling was conducted by monks in temple monasteries. Over the years, separate school buildings were constructed near the temples and named after the temples. 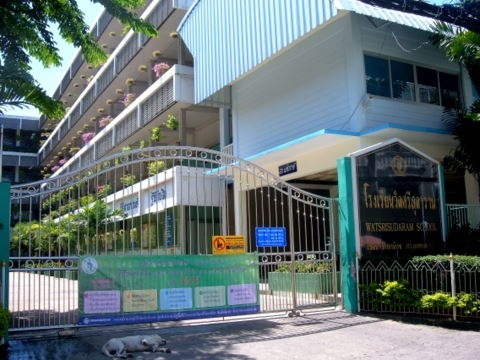 The Mahachulalongkorn Rajawitalai (Wat Sri Sudaram campus), a college under royal patronage, is opposite the school. 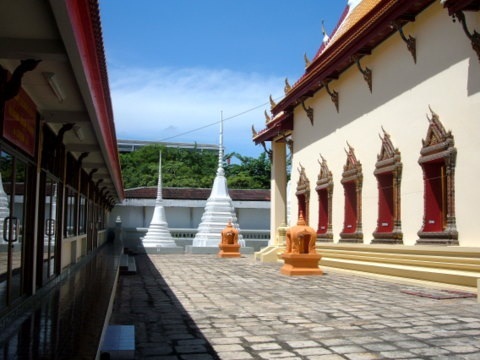 The ubosot (ordination hall) is to the right at the end of the soi. It’s a white building with walls all round and a courtyard within. 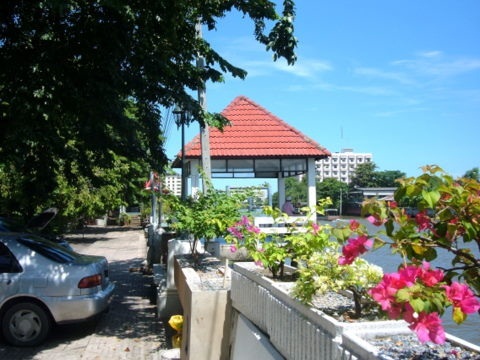 The front entrance to the ubosot faces the Bangkok Noi canal where there’s a pier named after the wat. If you are coming by road, go all the way to the canal to get to the front entrance. This is a legacy in the old days when canals or rivers were the main means of travel. 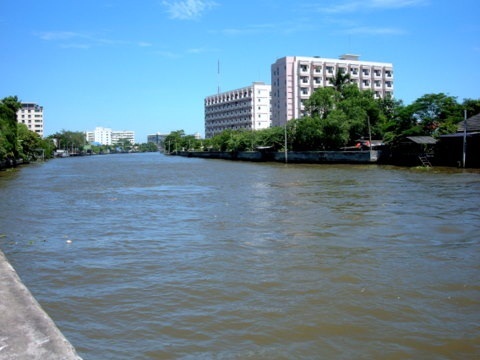 The Bangkok Noi canal was originally the main course of the Chao Phraya River which made a sharp meander. In 1542 a canal was dug at the base of the meander to shorten travelling distance and that canal became the course of the river today. Visitors in those days arrived by boat and hence the entrance of buildings face the waterway. I stepped through the only open door and entered the deserted courtyard within. These doors to the ubosot with their beautiful gold floral designs caught my eye. Across the road from the ubosot are the rest of the temple buildings. The signboard over the balcony of this two-story wooden library indicates that it’s a library of the literary works of Sunthorn Phu. But it was closed on that day. The Sala Kan Parian (preaching pavilion) further in is one of the buildings from the Ayutthaya era though it must have been restored over time. The centrepiece of Wat Sri Sudaram appears to be this giant statue of Phra Buddha Charn Tok towering over the temple grounds. But there was still something missing. I retraced my steps, walked around and still couldn’t find it. There weren’t many people around the temple grounds to ask. Then I noticed this muddy footpath that went past the bell tower. 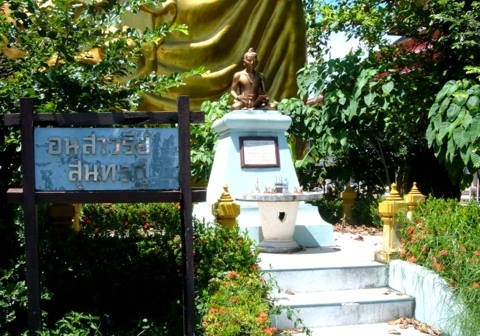 There by the canal hidden behind the giant statue was the Sunthorn Phu Monument. The casual visitor wouldn’t have seen it. If I didn’t know that the monument is somewhere in the temple grounds, I will not be able to find it. The monument here pales in comparison to his monument and memorial park in Klaeng, Rayong which I visited three weeks earlier. Please see Rayong – the poet’s inspiration. Sunthorn Phu’s father was a native of Klaeng in Rayong, a coastal province 200 km to the south-east of Bangkok. 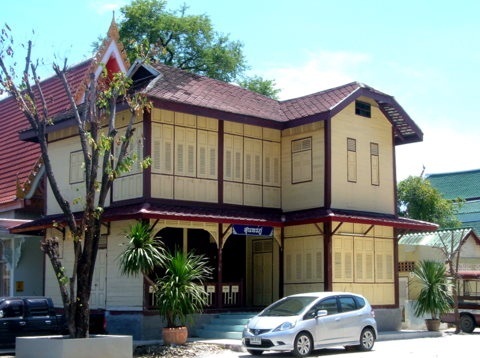 Though there were disputes in the past as to where Sunthorn Phu was born, what is indisputable is that he studied at Wat Sri Sudaram. 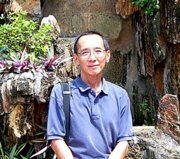 The temple will be remembered as the school of one of Thailand best poets. 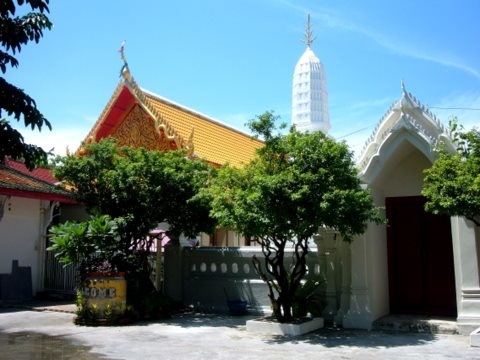 There’s another temple in Bangkok associated with Sunthorn Phu, Wat Thepthidaram where he was ordained as a monk. Take an air-conditioned bus service no. 79 from Central World Plaza or Pratunam in front of the Grand Diamond Hotel all the way to Bang Khun Non Road. Alight at the first bus stop after the bus has turned in Bang Khun Non Road. Fare is 16 baht as at September 2010. You can’t miss the way to the temple. At the entrance of the soi (lane), there’s an arch showing the name of the temple. 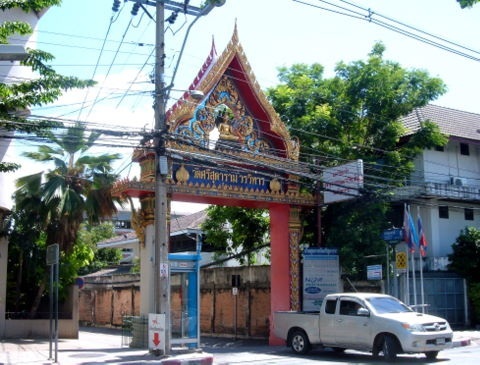 The lane is Bang Khun Non Soi 6 or Soi Wat Sri Sudaram.The temple complex is less than 100 m walk from the main road. 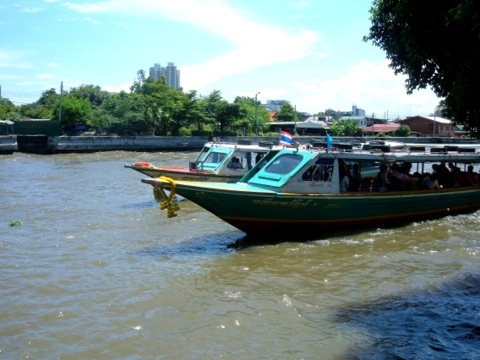 While you are there, drop in on the Bangkok Noi Museum and the Thai Bronzeware centre at Ban Bu nearby.